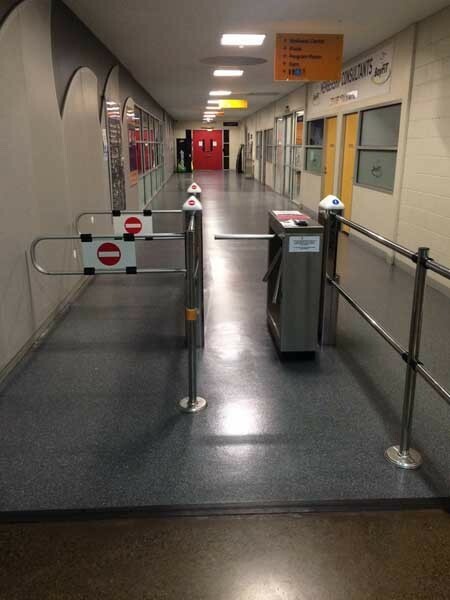 The application of DuraGrip PU non-slip sealer from Grip Guard Non Slip in Swinburne University’s dining area helped the institution achieve both safety and hygiene objectives. Impervious floors are used extensively in areas that have stringent hygiene requirements, as well as high safety standards. Key sectors that have benefitted from the application of DuraGrip PU non-slip sealer include healthcare, catering, aged care and dining facilities. Swinburne University recently chose DuraGrip anti-slip PU sealer for their dining area for several important reasons. The anti-slip properties achieved by the coating provide a P4 (or R10) slip resistance standard increasing the safety underfoot. The sealer not only improves the overall appearance of the floor but also protects the surface, extending its lifetime. DuraGrip anti-slip PU sealer offers a cost-effective solution to replacing a floor. Being low VOC, the anti-slip sealer is friendly to the environment. DuraGrip is suitable for vinyl, linoleum, rubber, epoxy, sealed timber, metal, concrete and tiled floors.